I know. We go to lovely places like Paxos to get away from the grind. But in this modern day it appears that the first question that we ask when we get to somewhere new is “What’s the WiFi code?” What is the Paxos Mobile Phone Signal like? And What About WiFi?. Well relax – mobile phone coverage is pretty good except on the eges of the island, and WiFi is available in numerous places. In this post I will describe my experiences with mobile data and Wi-Fi. What I am writing about is based on my experiences on the wonderful Greek Island of Paxos in August 2017 and August 2018, along with research done whilst back in the UK February 2019. I hope that I have done the legwork so you don’t have to, but please remember that subjects like this are subject to constant change, even on a sleepy Greek Island like Paxos! 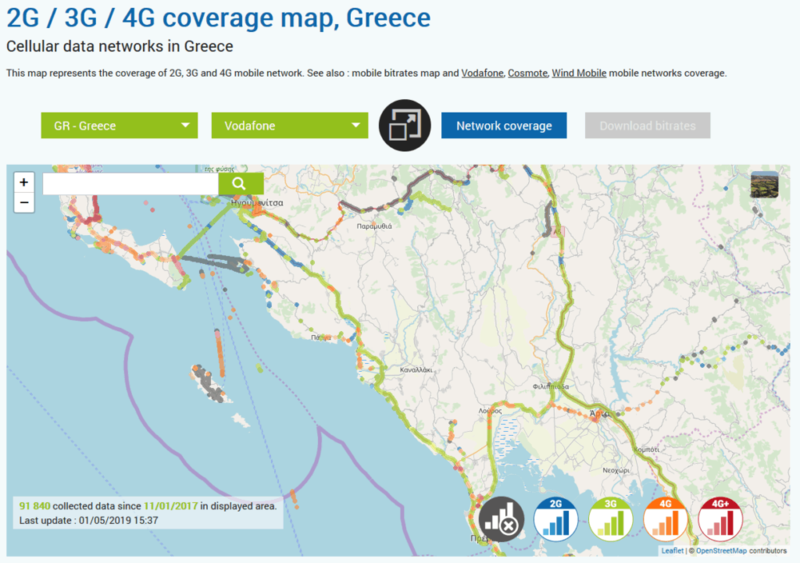 What are the mobile phone providers on Paxos? If you check the mobile phone signal checkers online you might think that the signal is virtually non-existent. Here are three maps from the Nperf website. Don’t worry it is much better than it looks. What is the phone signal like then? 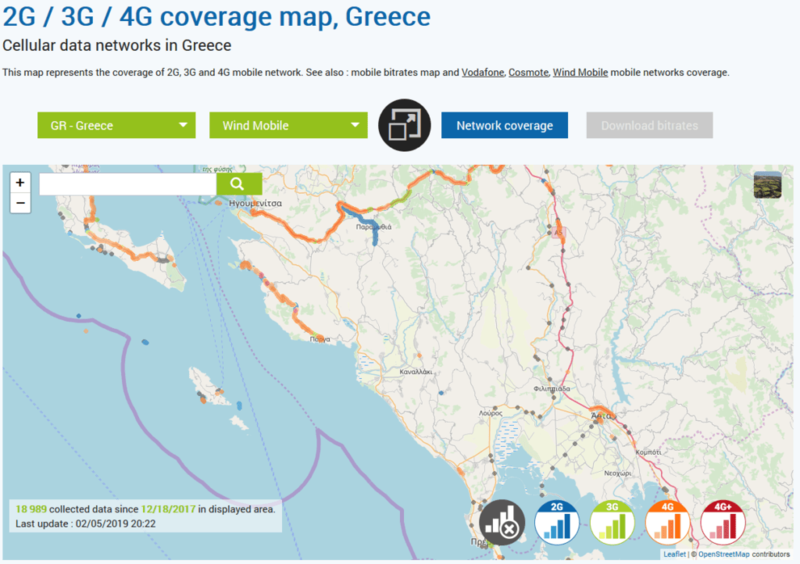 I found that I had a very good signal in the main towns of Lakka, Gaios and Loggos. I also had a pretty good signal in-between these places, only losing the signal at the edges of the island. I even had a 4G signal on the ferry from Corfu, with a brief dip in service between the islands. And on the day out on the hire boat I had a signal in many places. Did I get a signal on Antipaxos? Yes. Sort of. I was busy driving the boat or taking photos and videos to be honest so didn’t think too much about this. When I check the photos I took with my iPhone it did record where I was sort of. Around Paxos my phone recorded my location as Paxi, but on Antipaxos it thought I was in Corfu! So, there was clearly a data signal on Antipaxos even though the maps suggest otherwise. Can I use my existing mobile phone provider? Yes. 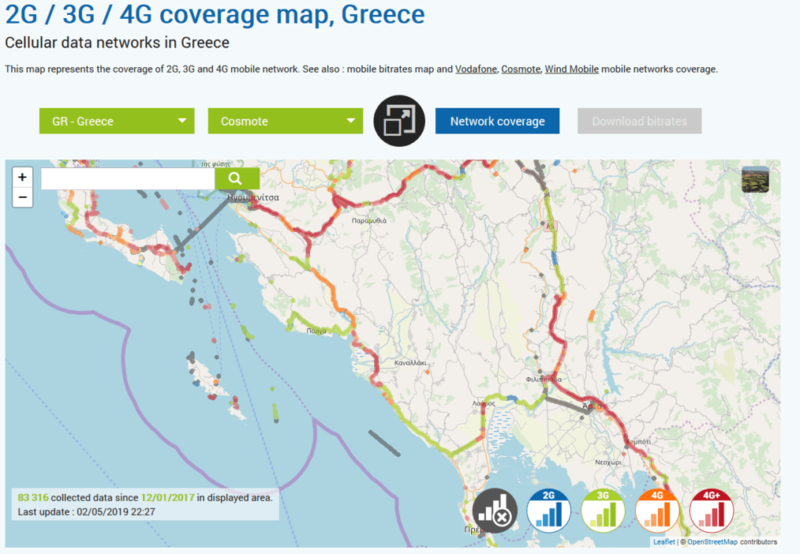 I am on Vodafone, and am able to use my existing data, calls and text message allowance in Greece, which is one of their 48 roam free destinations. And my wife is on EE which also worked just fine, connecting to a phone signal straight off the plane in Corfu and only dipping out on the ferry briefly. And when I got to Paxos my phone was connected to Vodafone Greece. Who knows? At the time of writing none of us know what is going to happen come Friday 29th March when we are supposed to leave the EU. I suspect there will be some uncertainty and disruption, and we may get charged for phone use in the EU. But then again I don’t see why as the Vodafone roam free areas include non-EU countries. Who knows – lets worry about that after the 29th March! There are a few other things to worry about between now and then! But in the meantime, check out the official advice here. How much do calls and data cost? Check with your mobile phone provider – hopefully you will have roam free coverage. If not make enquiries in the UK – it is normally cheaper to arrange the most cost-effective roaming package when you are in your home country wherever that may be. My roam free package means that I can use the data, calls and text messages within my monthly allowance in roam free areas like Greece. You can check out the Vodafone roaming info here. Not something that I have tried, but you can get prepaid SIM cards for most places on this weird and wonderful planet of ours. This is well worth looking into if you don’t have a roam free package. As I do have a roam free package I have not needed this so don’t know anything about it other than the fact that if you are paying for calls abroad it can be much cheaper to go this way. On the very edges of the island, down at some of the beaches, sometimes on the rental boat and in-between Corfu and Paxos. Other than that, I had a signal everywhere else. Please do not rely on this information for anything important – if you are relying on a phone signal for personal safety or navigation services please check first – these things can vary depending on many conditions and variables. And I also had a phone signal for much of the ferry trip from Corfu to Paxos. Not to be relied on though for safety reasons – make sure that the boat rental company know exactly where you are going and when you will be back! Wi-Fi availability was pretty extensive. Many hotels, bars and restaurants in the main towns of Gaios, Lakka and Loggos have readily available and pretty decent Wi-Fi. I will not list them here – all you need to know is that the provision of Wi-Fi on Paxos is pretty good. Take a Satnav with a map that covers Paxos (if you can get one that is!). If you are driving on Paxos then the chances are that you have hired a car. With some car rental companies you can hire a Satnav – check first though. And also check the map coverage which can be a bit hit and miss. You can read more about renting a car on Paxos on this post How do I rent a car on Paxos Greece? But much better that taking a Satnav which may or may not work. Much better than a Satnav is a good old-fashioned map. You won’t lose the signal with a map! Make sure it is a road map of the island, and that you know how to read a map!! Try this. Turn your phone off! You are on the wonderfully relaxing Greek Island of Paxos. Turn your phone off. Have a digital detox. I know – I didn’t do this – like everyone I use my phone for so much these days, especially as the high-quality camera in my pocket. Not good considering I am a photographer. But try turning your phone off for a day and I guarantee you will not miss it! And try not walking around Gaios staring at your phone – that is an interesting experience when a large number of people get off a boat at the same time doing just this! Can I get Wi-Fi and data on Paxos? Yes, you can in most places, and the standard of the service is pretty good. Please make sure that you have alternative arrangements in place though and do not rely on the phone signal for critical things like going off on a long walk or taking a boat way off the island. Make the safety precautions that you would have done in the days before mobile phones. Be safe and enjoy Paxos. Previous PostPrevious Paxos Hotels With Pool – Essential For The Hot Summer Months!